May I visit your store? Yes, and you will be most welcome! We are located in Purcellsinch Business Park which is off the Old Dublin (Carlow) Road on the edge of Kilkenny City in the southeast of Ireland. Turn in off the Old Dublin Road at the tall silver sign for Ormonde Retail Park. Here you will see Chadwicks and Electro City. Continue past their entrance, over the little bridge and on into Purcellsinch Business Park. Veer right after the security hut and follow the signs for Threads of Green right down to the bottom. You will pass Veolia Water Treatment and Colourworld Print on your right. The next premises is home to Threads of Green Fabrics, a brick building with large windows, green blinds and a roll-up door. When you register and create your account with threadsofgreenfabrics.com, we’ll remember your information so that the checkout process is as hassle free as possible. You will also be able to ship to different addresses. It also gives the online shopping service an extra level of security. How do you remember my name when I return to the site? Threads of Green Fabrics operates a ‘no quibble’ Returns Policy. We will issue a refund for goods returned to us that have not been cut and are in perfect condition. We do not refund outward or return shipping charges. However, if, in spite of our meticulous quality checks, you need to return fabric because it is flawed, we will refund shipping charges. We request that returns are made within 14 days of the date of your invoice and we recommend that you request a Shipping Receipt/Certificate of Post from your shipper or Post Office when you do so. Once we are satisfied that the returned fabric is in perfect condition or that it is genuinely flawed, we will issue the appropriate refund within 15 working days. How can I get a sample of fabric? A metre is 39.37 inches long so it is approximately three inches longer than a yard. Fat quarters are pre-cut pieces of cotton fabric. They are taken from one yard of fabric cut in half lengthwise and then in half widthwise. The dimensions are approximately 18″ x 22″ (46cm x 56cm). A long quarter yard cut from a bolt would measure 44″ x 9″ (112cm x 23cm). How reliable is the colour reproduction of your fabric photos? Every effort is made by our photographer to ensure true colour reproduction of our fabrics. However, there are many variables over which we have no control and we cannot guarantee perfect colour replication on your screen. If you are colour matching, we recommend ordering a swatch prior to your main purchase. Do all Threads of Green fabrics appear on the website? No, they do not. We have 1,000’s of fabric in stock at any one time. Some of them turn over very rapidly and never make it to our website. If you have a fabric need that is not answered by our ranges online please contact us at sales@threadsofgreen.ie and we will do our best to meet your requirements. Does Threads of Green Fabrics offer discounts? Discounts for bulk purchases cannot currently be processed online. 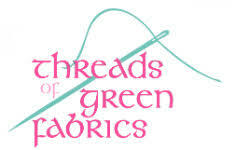 Please email us at info@threadsofgreen.ie and we will give you personal assistance. It is our policy to despatch orders within 24 hours of receipt, subject to availability. If there is a problem with availability we will advise you of this as soon as possible. What currency is used on your website? All our prices are shown in euros and are inclusive of VAT. Value Added Tax or VAT is a general consumption tax applied to most goods and services bought and sold for consumption or use within the European Union. It is charged as a percentage of the sales price. VAT on fabrics is 23%. VAT is charged to consumers within the European Union. Persons living in countries outside the European Union do not have to pay VAT.